One of the most well-known synonyms of the term, “Yoga” is “Dhyānam,” or meditation. While meditation culminating in a state of deep absorption, and hence, complete mastery over the object one meditates upon is the pinnacle of Patañjali’s Aṣtanga-yoga, it is necessary to first train the mind to focus on a chosen object and sustain that focus for a certain period of time without distraction. Meditative practices that incorporate simple visualisations, affirmations and also integrate the use of certain chants are known to promote attention and also enable calmness and tranquillity. These meditative experiences also give us the strength to cope with modern-day stress and find viable solutions to our problems through practices of inward oriented reflective. 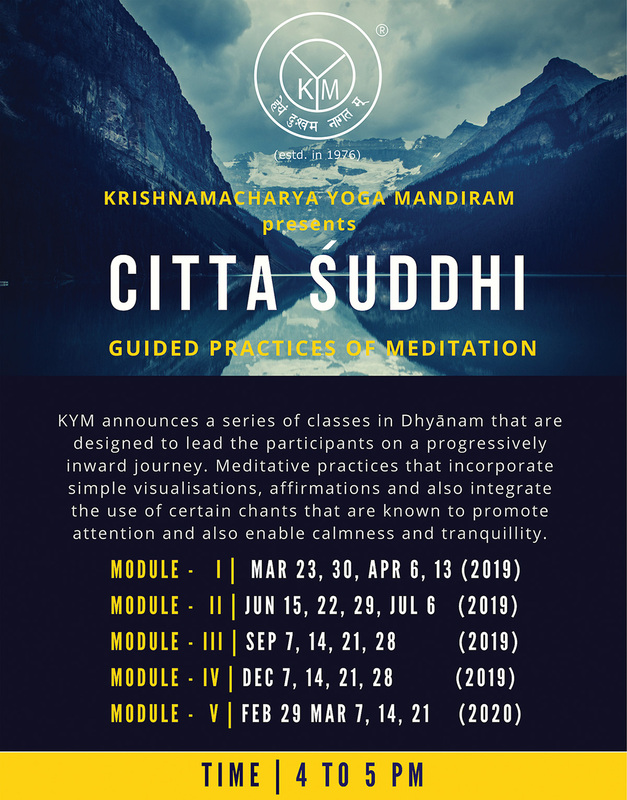 KYM announces a series of master classes in Dhyānam that are designed to lead the participants on a progressively inward journey.